I have been a little slow with the expression language of PowerPivot DAX mainly because I felt it a little hard to understand. Maybe this problem comes from my mind being occupied by MDX, TSQL and the expression language in Reporting Services. Right now I have som starter functions that can help with getting to know the DAX syntax better and perhaps answer some common business questions that are not to complicated. All my examples comes from the Adventure Works star schema model that you need to import into PowerPivot first. 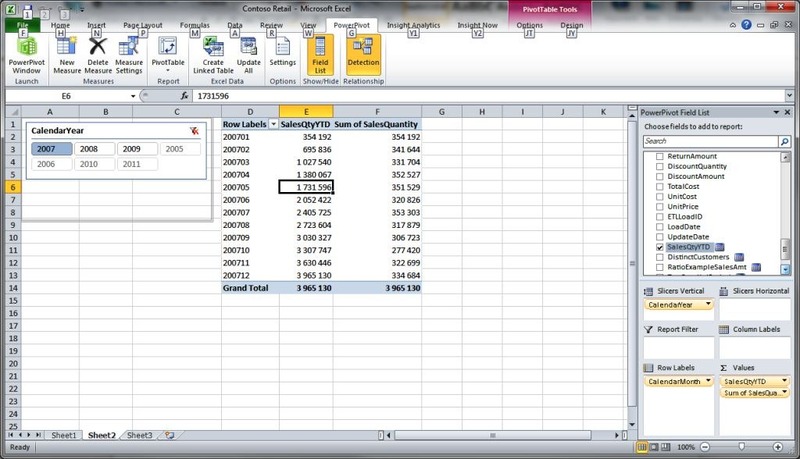 Start with doing your calculations on top of a Pivot Table with PowerPivot tables as the source. Calculations in the PowerPivot tables will only make your more confused. You find this editor under the PowerPivot tab in the Excel ribbon under new measure. Make sure that it is the fact table that is selected as the table name at the top. Here I am thinking about the aggregation formulas that you get when you drop a measure in the values box in the Pivot Table design tool. You do not need the editor above to create these standard aggregation formulas. Here comes a new taste of DAX where we need to combine to DAX functions to get the result we want. Distinct Count is hard to set up in Analysis Services beacause of dfferent technical requirement of that model. In PowerPivot and DAX we have this available by using two functions that are not too complicated. Remember that end users often confuse Count and Distinct Count. The syntax is as this: =COUNTROWS(DISTINCT(FactInternetSales[CustomerKey])). First it is the CountRows function and with the Distinct function inside of it. In the Distinct function we point to the dimension key that we are interested of doing a distinct count on. In this case it is the CustomerKey in the fact table. ProductKey or any other foreign key will work in the same way. It is important that your PowerPivot model has complete years regarding dates in order to avoid strange results. The Adventure Works star schema model has this limitation. 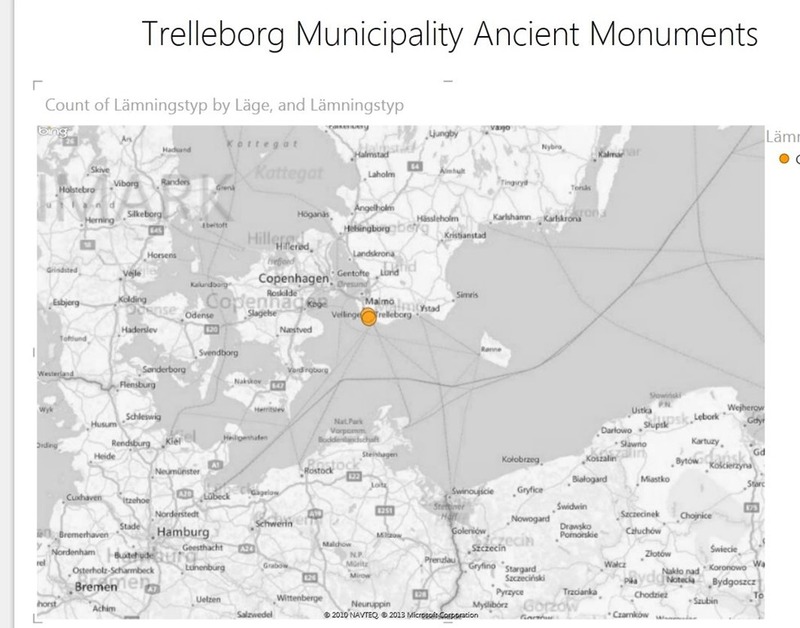 The example is from the Contoso Sales sample database. DimDate is the date dimension table and the DateKey is a date column. The fact table name here is FactOnlineSales and SalesQuantity is the measure in that fact table. The result looks like this in Excel 2010. Ratios introduce a new generic DAX function called Calculate and a little different thinking than in the previous examples. If we want to build a ratio in DAX with the measure SalesAmount we need the nominator, that is the current aggregated value in the Pivot Table and divide that with the denominator or total of SalesAmount that is always the same. 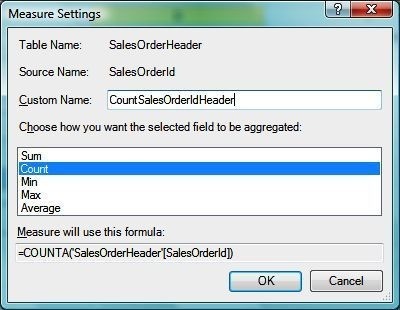 In DAX and with the Contoso sales example database this can be built in this way. There is one book that I can strongly recommend if you want to learn more about DAX and PowerPivot models and that is Marco Russo’s and Alberto Ferrari´s “PowerPivot for Excel 2010 Give Your Data Meaning. More information can be found on this link. In SSAS cubes we mostly use the starschema model with a central fact table and dimension tables as navigation paths down to the measures. That model will work in many scenarios and return valuable insights into business processes. In this model we do not connect fact tables to other fact tables directly but the relation appears with related dimensions. With the arrival of PowerPivot much talk have been focused around DAX, the expression language, or formula language, for PowerPivot. I believe that this is only part of the story. PowerPivot have a more flexible model where you can do this but also relate fact tables with different granularities directly to each other. 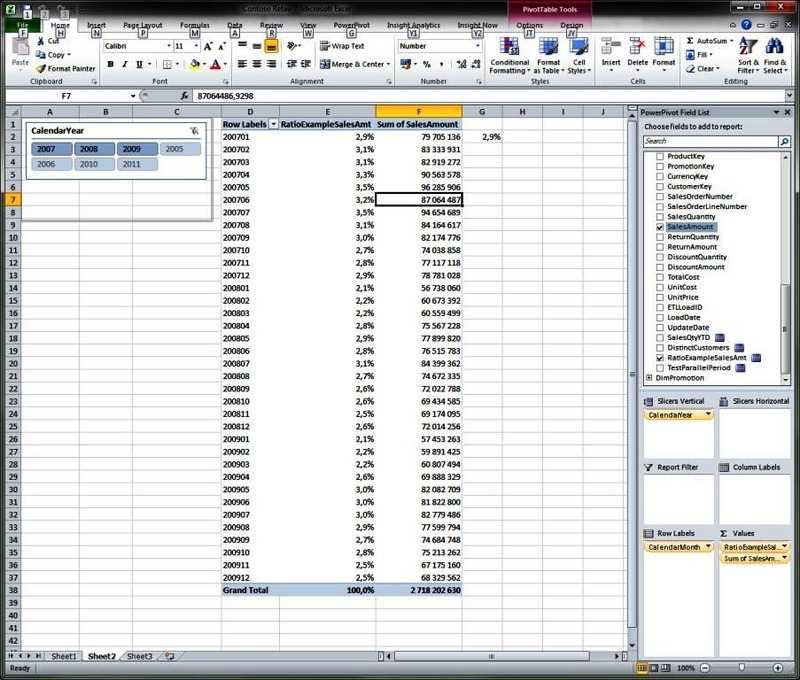 This will give you added flexibility in a Pivot Table. This is a recreation of a report scenario that I have tried on real production data but I will use one of the other Adventure Works demo databases that is more transaction oriented. I have created a product table(product attributes) and a date table(single dates, Year and YearMonth(200801) attributes. Fact tables are both SalesOrderHeader and SalesOrderDetail. You will recognize the dimension tables as the slicers but I have used some TSQL code to build this in this more detailed version of the Adventure Works processes. The two fact tables are the OrderHeader table and the Order detail table. Both tables include the OrderNumber column that I have dragged to the values area and changed the formula from SUM to COUNT. 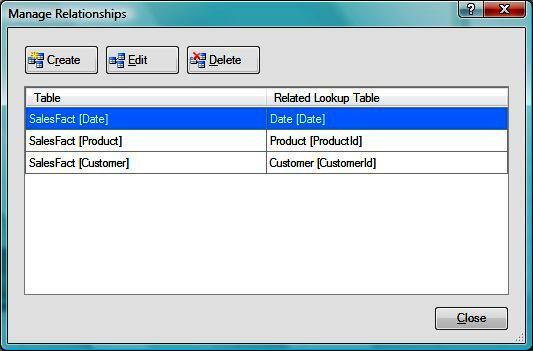 The relations tab in PowerPivot is where you create the more flexible model. 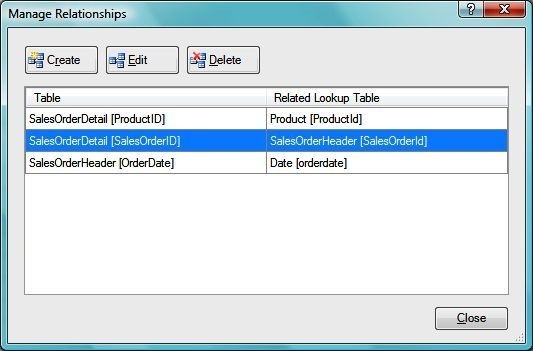 In this model Product is related to the SalesOrderDetail(ProductId) column and Date to the SalesOrderHeader table(OrderDate). SalesOrderDetail is related the SalesOrderHeader table with the SalesOrderId column. Finally, this is the behaviour in the Pivot Table with this setup. Product categories and year level of the order date column are used as slicers above. 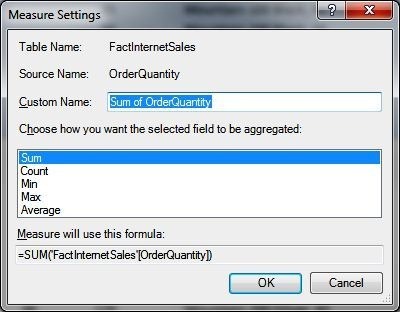 If you click on a product category member in the slicer only the count measure of the SalesOrderDetail table will change(CountSalesOrderDetailsRecords). If you click on single years both the CountSalesOrderHeader measure and the CountSalesOrderDetailsRecords will change, since the top fact table filters the lower fact table. Edit: I would like to add that PowerPivot models are optimized as star schemas without a relation between the fact tables. My approach above will face performance challanges with too much data. Edit: This post was updated after the format chaos that appeared at first. More than 15 years ago I started my professional career in IT as an Excel teacher. One excercise that I frequently used was a simple math problem that you start with in your first year of school as a kid. Make sums of fruits in order to demonstrate how cell references works. 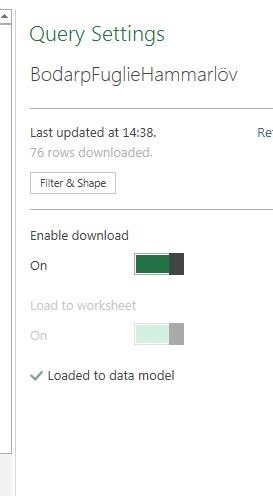 I would like to use the same simple example in order to demonstrate how a simple data model in PowerPivot can be built for non database professional and other interested in an introduction to PowerPivot. The model that I will describe is a data model called a starschema. First: Build a simple table in Excel. 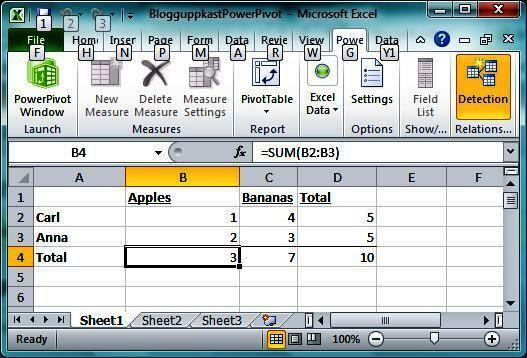 I use Excel 2010 which is a requirement for the PowerPivot add in for Excel. With the word snapshot I describe the table as a state at the end of the day describing what two people(Carl and Anna) have bought from the grocery store. I assume that both have not consumed the fruit yet. The transactions behind this snapshot are the following(see the second picture below). A transactional way of looking at the data is transformed into a summary about the state at the end of a day regarding how many fruits that Carl and Anna have bought. 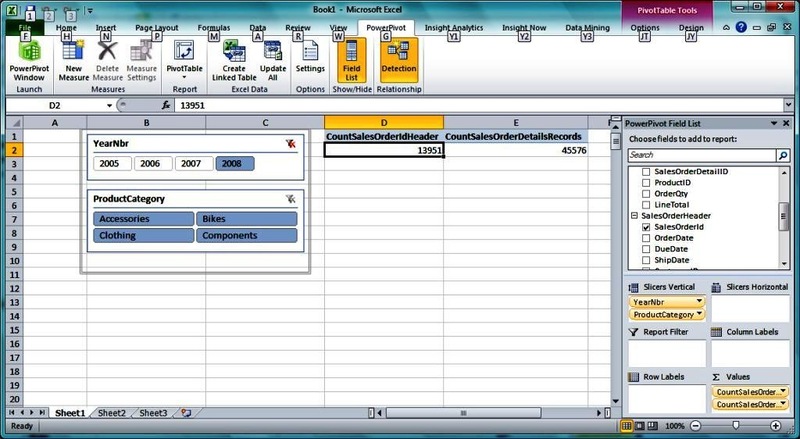 The table above is formatted by using the Format as Table button in the Excel ribbon. 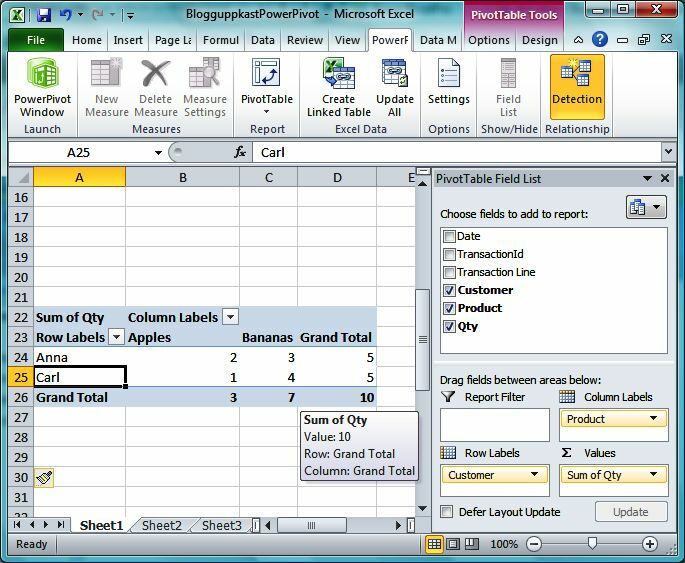 On top of the transaction table above you can create a Pivot Table by using place the cursor in the transaction table and select Insert and Pivot Table in the Ribbon. The result is seen in the next picture below. This is how most end users use their table shaped data and Pivot Tables in their daily work. The example above is not how PowerPivot will work in the best way but a current praxis by many Excel users. 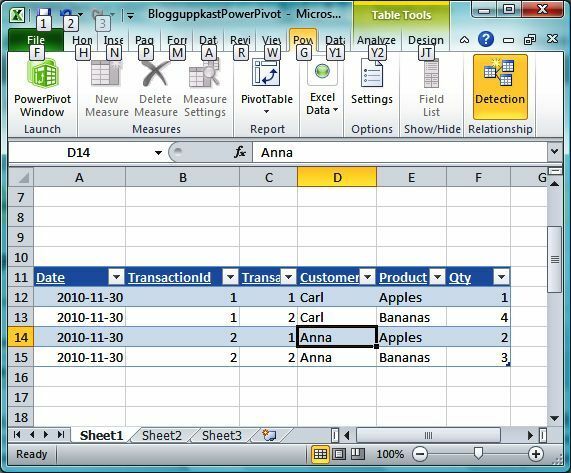 PowerPivot will require you to organize the data differently than the data dumps in a spreadsheet. Remember that for this simple example PowerPivot is not necessary but I like to use simple examples to demonstrate a more complex scenario of how you can organize data in the best way. 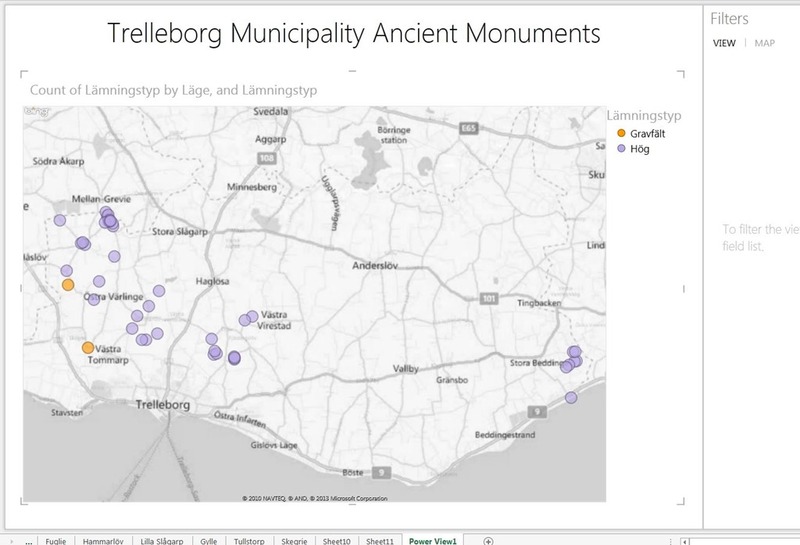 That is also the structure of the data that will be presented to Excel end users. I have constructed four small tables in the same Excel sheet above. Three of the tables are dimension tables(Customer, Product and Date) and in the real world they will have more columns than in this simple model. The table with most columns, below the dimension tables, is the fact table that contains one measure(Qty) and the other columns are connectors to each dimension table above. Be aware of that I have called the customer identifier in the dimension table CustomerId but Customer in the fact table. When I add these surrogate keys, like they are called technically, the customer can change name. The surrogate key will be the same. I have the same setup with the product dimension and the fact table. Why would you do something complex like this when it is possible to do this much more simple, like the examples that I showed earlier? If you think a little bigger and imagine that you will have dimension tables with thousands of products and customers and maybe 1-2 million rows in the fact table. Also you will probably get these tables from the source system that are structured like the mini tables that I show in this spreadsheet. You can simply enter the same data and then format each mini table as a table by the format as table option in Excel. 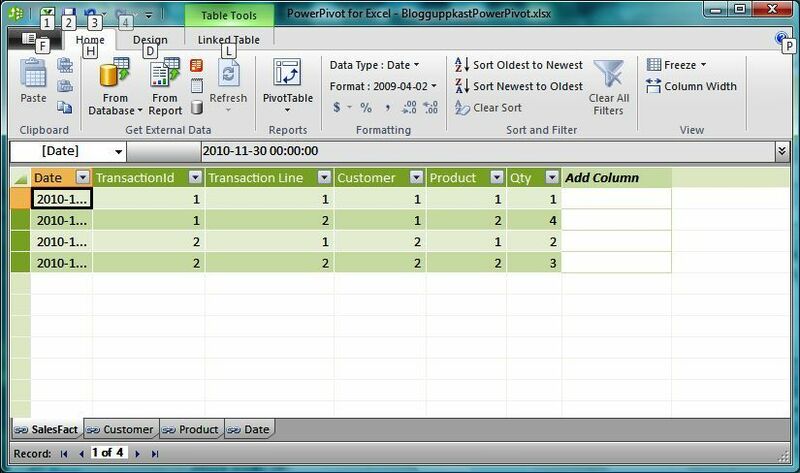 In the next step will will add each table above to a PowerPivot model by using Linked Tables in PowerPivot. Place the cursor in each mini table in the Excel spreadsheet and select the “Create Linked Table” under PowerPivot in the Excel ribbon. After you have imported these tables you can see them in the PowerPivot window as separate tabs. I have renamed the tables with more descriptive names than table1. Relations are defined from the fact table to the dimension tables in PowerPivot. I have defined a relation between the date column in the sales fact column and the Date column in the Date table. In the last step we will have to define the relations between the tables that we have added to the PowerPivot model. Under the design tab in the PowerPivot Table Tool you can see the Manage Relationships button to get the dialoge window below. After all relations between the dimension tables and the fact table have been defined you will see the following relations. Below is the final report build in Pivot Tables with the PowerPivot tables as the data source. I also show the start micro tables in the spreadsheet but the data in them has been copied in to the PowerPivot data store. Soccer is the US name for football and even little Sweden have a national league with a top division called “Allsvenskan”. There is statististics published during the season regarding how many penalties, free kicks, red and yellow cards that the players in each team have collected. 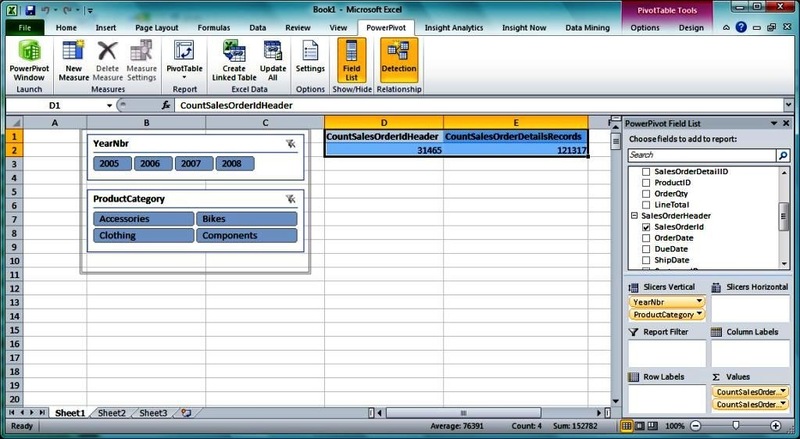 My thought was to see how I can collect and analyze that information in Gemini and Excel 2010. Before that fun begins let me sum my thoughts about Gemini. Parts of it also come from different discussion forums and MS presentation material. 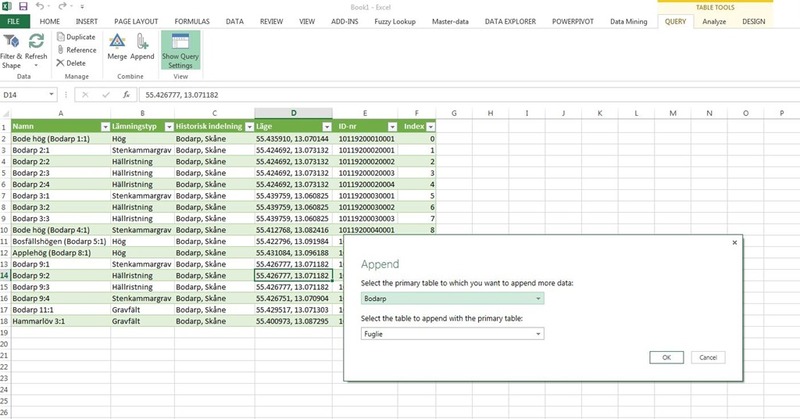 Gemini let you build large tables, from databases, web page information, Excel and text files, without having to use a ETL tool like Integration Services, connect that information and analyze that data in Excel Pivot Tables. You can do this locally in Excel 2010 or publish the information to the Gemini Server that is part of the next version of Sharepoint. Gemini is not the same as the next version of Analysis Services that will be part of SQL Server 2008 R2 and is planned to be released next year. Gemini is a new Sharepoint application that relates to Analysis Services but it is a new and separate track. The Sharepoint part will only bee needed for publishing Excel/Gemini data to a server. The client part, that I am using here, will only require Excel 2010. 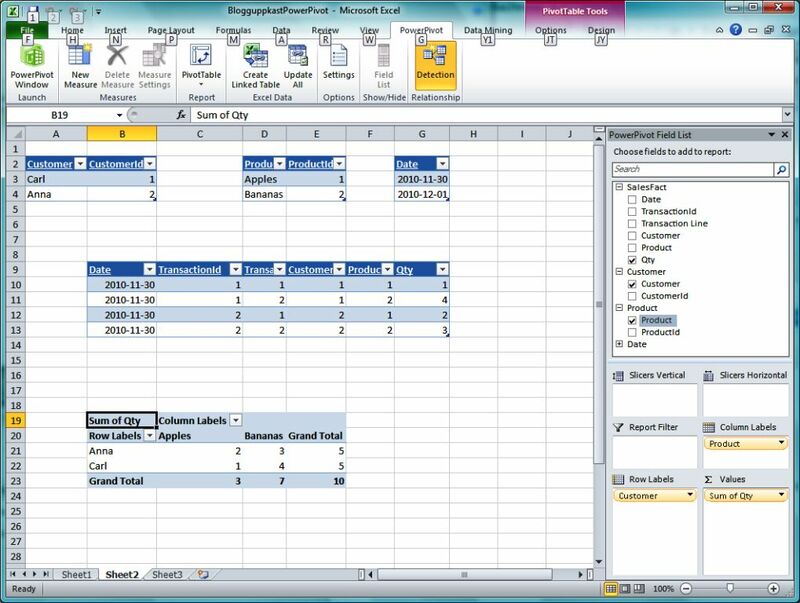 Previous versions of Excel have only the notion of rows, columns and cells that make it hard to use this data source as a relational data store even if it is supplied with plenty of functions that tries to mimic the notion of relational data. Back to Gemini and football. I have collected the statistics below from an official web page by simply marking and copying the 14 pages that includes all the Swedish licensed players in the highest division. The first page includes statistics about red and yellow cards for each player. I would like to have all statistics, inclusing also caused free kicks and received free kicks, on one page but that is not the case here. It is also the challange for Gemini to connect disparate information in an easy way. You can see my LagNamn column (Team Name) as the last column in the Excel tab that will secure the unique identfier between the two tabs in Gemini. The second excel sheet contains the caused free kick and received free kick data but with the same player names and team codes as the first sheet. I have imported both into the same spreadsheet but have them on separate tabs. Both tables are formatted as tables with the Excel format as table option. A first issue appeared here in my first attempt to copy and paste the information into Gemni that you simply do by marking all the records in a tab and select copy in Excel and then go to the Gemini add in tab in Excel and select load and prepare data. In the Gemini environment you will have the “to new table option” available in the ribbon in the second group of buttons from the left. The problem is that a few of the 417 licensed players have the same name and that gave me an error when I tried to create a relation, in Gemini, between the to tabs of data by only using play names( first and lastname). Excel 2010 has a button under the data tab in the ribbon where you can remove duplicates only to check if the tab contains duplicates. Excel 2010 will tell you that it has found duplicates before you need to remove them. First i tried to build a concatenated string of the team and the player in Gemini with the DAX statement: = [Team] & [PlayerName], but the problem is that these statements will not show up when you try to relate the tabs in Gemini. 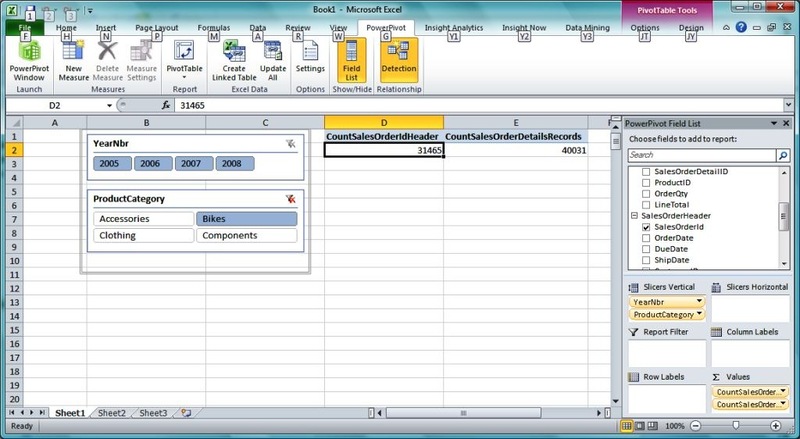 If I do the same string concatenation in a column in Excel 2010 and then import that into Gemini, I can use it when I create relations between the tabs. You will see the final relation in Gemini below. Varningar is my first tab with red and yellow card information for each player and team. Frisparkar(free kicks) is the second tab and both use the Excel concatenation of team and player name as the key. 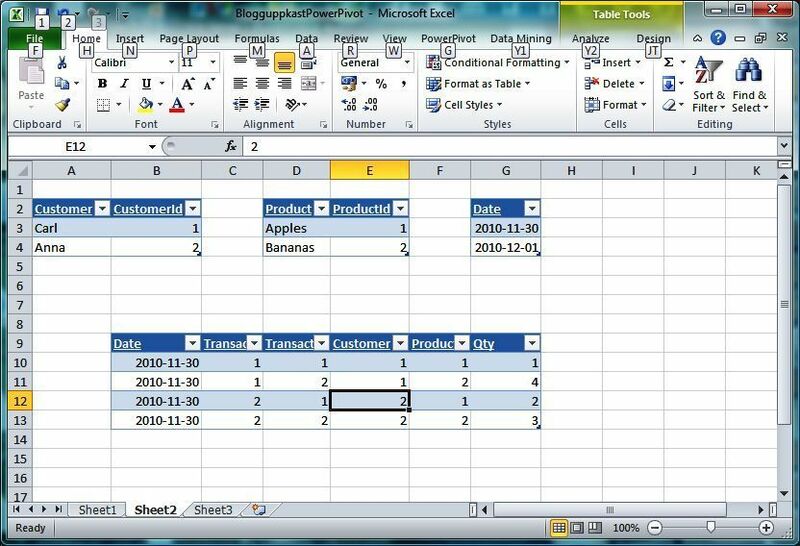 Finally, when I have imported the data ifrom the two tabs into Gemini and have created the relation between them I can use the information in Excel Pivot tables and do the analysis. Now I can see each teams caused free kicks, received free kicks, red and yellow cards and penalties. I can drill down on each team to see the statistics for each player. “Diff frispark(Swedish) is the difference between the number of received free kicks and caused free kicks. “Diff straff” is the difference between thenumber of received and caused penalties. The two last columns is the sum of the number of yellow and red cards. Measuring the difference between the last two columns does not make any sence. Gemini is not only about analyzing large amount of data but also about getting relational storage capacities naitivly in Excel 2010. It is that functionality that let you build quick structures for analyzing data that can be a complement to the classical data warehouse approach. The source for the statistics is here. It is only in Swedish but you can clearly see what I have started with.